Is the tide slowly turning for Southeast Asia’s boat people? The waves of refugees and economic migrants attempting to cross the seas has too often been seen as a threat to be repelled. Now, certain key countries are suddenly implementing progressive policies for helping rather than turning away desperate individuals and families smuggled across the seas. This needs to be the beginning – not the peak – of regional and international cooperation on what is fundamentally a humanitarian issue. UN figures suggest that 25,000 refugees and migrants left Myanmar and Bangladesh in the first quarter of this year, double the number over the same period in 2014. The region has been slow to act. Asean’s motto of “One Vision, One Identity, One Community” hardly stands up in the face of its members turning away boatloads of human suffering. The Association of Southeast Asian Nations, currently chaired by Malaysia, has had nothing to say about Myanmar’s persecution of its Rohingya minority. However, last week, following the Philippines’ announcement that it is prepared to receive up to 3,000 potential refugees, Malaysia, together with Indonesia and then Thailand, announced a reversal of the policies of turning away boats. Malaysia and Indonesia agreed to temporarily receive up to 7,000 Rohingya and Bangladeshi people, and offers of resettlement are dripping in from countries as far flung as Gambia in West Africa. Recently, the Thai government has targeted the human trafficking gangs with action that the Asian and international community must develop into a broader, coordinated approach against this dirty business. One boatload of desperate people can be sold to Thai smugglers for US$30,000. Smugglers then hold these people prisoners, often around the Thai-Malay border – where mass graves have been found – and demand over US$1,000 per person in ransom from their families. The effects of cracking down on the smugglers have resulted in the gangs now abandoning refugee boats far out to sea. The Thai authorities need support from the international community. Now, even Myanmar is changing its stance. It has long refused to participate in any talks that threatened to mention the Rohingya people by name. But it is sending officials to Bangkok this Thursday, when Southeast Asian nations will discuss the human trafficking crisis. According to a Myanmar government spokesperson, assurances that the term “irregular migrant” will be used instead of “Rohingya” have brought them to the table. The US is also getting involved, offering financial aid and indicating a willingness to receive some of the Rohingyas permanently. It would be gratifying to see Beijing step up and offer assistance: that could only help reduce the impression that China tends only to get involved in Southeast Asia when seeking opportunities to advance territorial claims. What has prompted certain nations to act for the good of humanity now? Moral leadership had been at best ignored and, in some quarters, utterly lacking – including from Aung San Suu Kyi herself. Myanmar nationalists in the 90 per cent Buddhist state depict Suu Kyi as “the Muslim lover” in a country where public sympathy for Rohingya Muslims is conspicuously absent. But now that Myanmar’s government has finally acknowledged the issue exists, Suu Kyi should take the risk of losing some votes in November’s election and speak out. The reasons for the improved efforts lie more internationally, with prompts coming from recent UN condemnation of the refusal of Southeast Asian countries to rescue those adrift at sea, together with unprecedented media reports. Last week, the BBC showed the world footage of life on board: throngs of increasingly sick people live for months in filthy conditions, stacked on overcrowded wooden shelves in the hold – a sight painfully reminiscent of the Atlantic slave trade, something we thought had been consigned to history. Last month, boats carrying almost 2,000 people from Africa to Europe sank in the Mediterranean Sea, with over 1,200 lives lost. The European Union is now planning military operations to inspect, seize and dispose of vessels involved in the smuggling of migrants. UN Security Council permanent members China, Russia and the US are also in on these EU negotiations. We need to see the UN and its member states take a global view of this issue: the underlying causes of poverty and persecution which drive people from Africa and the Middle East to make the harrowing journey to Europe are similar to the issues Southeast Asia is now confronting. Last week, in rejecting Indonesia’s direct request for assistance, Australian Foreign Minister Julie Bishop seized upon the Indonesian government’s claim that only 30 to 40 per cent of people rescued from the Andaman Sea are Rohingya asylum seekers. In response to developments in Southeast Asia, Prime Minister Tony Abbott said, “I don’t apologise in any way for the action that Australia has taken to preserve safety at sea by turning boats around where necessary.” He described that as “necessary if the scourge of people smuggling is to be beaten”. Indonesia and, by implication, Australia, estimate that 60 to 70 per cent of those stranded at sea are illegal labourers from Bangladesh who seek jobs in Malaysia. If such an assumption is correct, so what? So what if some are political refugees and some are economic refugees? These Bangladeshi are still in desperate need, like the Rohingya, but for different reasons. People – and that is the key word, whether they be Bangladeshi or Rohingya – are duped by criminal gangs who extort quantities of extra cash from the families of their prisoners and hold them in appalling conditions. Over the past week, at a time when Australia – once presented as a beacon of democratic light and civilised development in a region of unsavoury regimes – has pointed the finger at those stranded at sea as economic imposters, Myanmar has taken a progressive turn. Last Friday, Myanmar – which at 150th on the UN’s Human Development Index is ranked below every Asian nation bar Yemen and Afghanistan (whereas Australia is ranked second in the world) – performed its first rescue of a migrant boat. Over 200 people – all Bangladeshis, apparently – have been saved by Myanmar’s navy. We can only hope governmental talks in Bangkok bring more progress. It’s time all players in the region and beyond stepped up to the mark, for the good of humanity. Paul Letters is a freelance journalist and novelist. 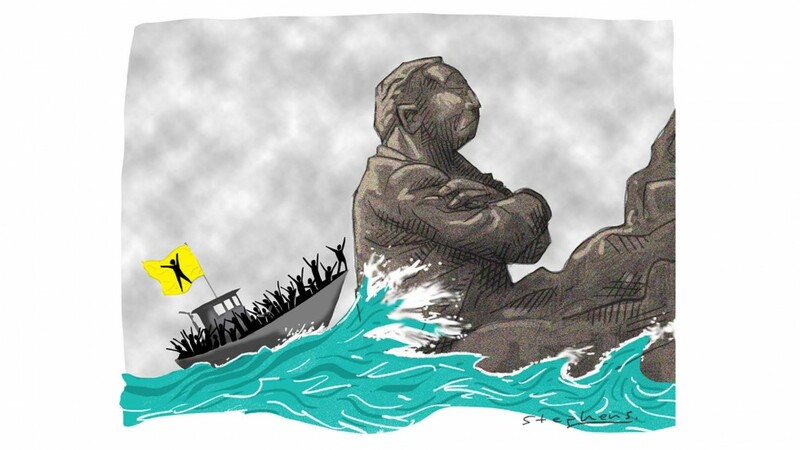 This article appeared on scmp.com as Is the tide slowly turning for Southeast Asia’s boat people? and in the South China Morning Post online print edition (27 May 2015) as Turning tide?